A 59-year-old woman with no relevant past medical history was referred to the Outpatient Clinic due to iron-deficiency anemia (minimum hemoglobin level of 6.8g/dL). 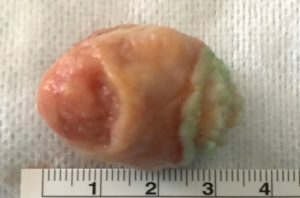 Upper endoscopy showed a large smooth-surfaced polypoid lesion occupying most of the duodenal bulb (Figure 1). Ileocolonoscopy was normal. Figure 1. 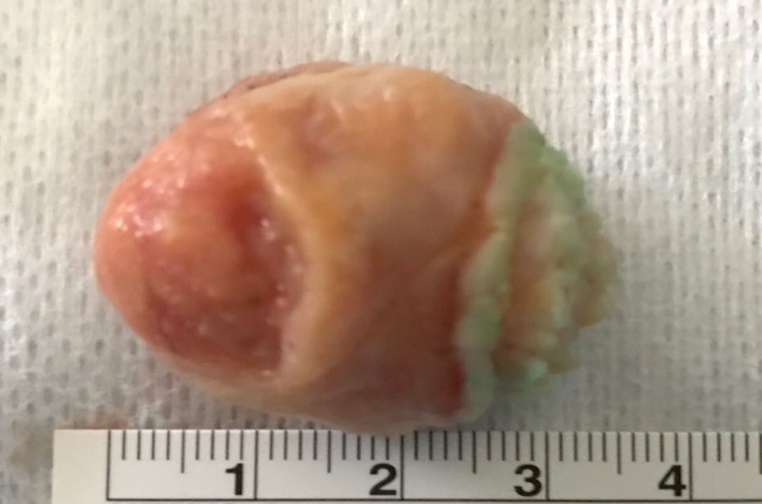 Upper endoscopy showed a large polypoid lesion covered with intact mucosa in the duodenal bulb. 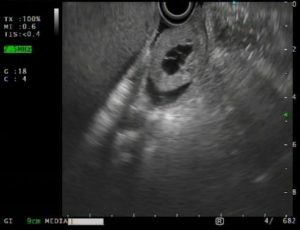 Endoscopic ultrasound (EUS) revealed a 36x24mm heterogeneous mixed echoic submucosal lesion with multiple cystic areas (Figure 2a), with a 14mm thick short pedicle (Figure 2b) and a feeding artery on color Doppler. Figure 2. 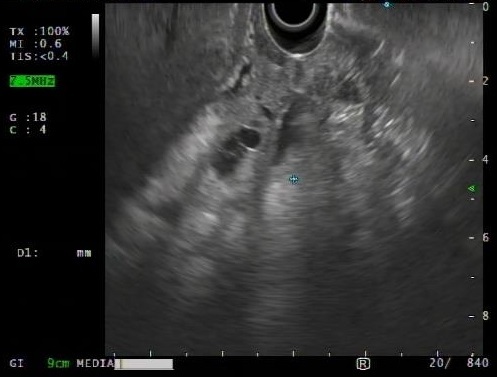 EUS showed a larged mixed echoic submucosal lesion with cystic areas (Figure 2a), with a short pedicle (Figure 2b). Bite-on-bite biopsies were taken where Brunner’s glands hyperplasia was identified. Resection of the lesion with a hot snare after submucosal injection of diluted adrenaline was performed, without complications (Figure 3). 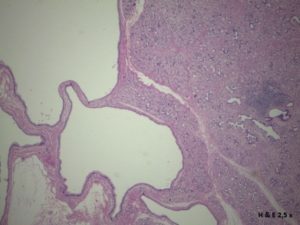 Histopathologic diagnosis was Brunner’s gland hamartoma (Figure 4). Figure 3. Endoscopically ressected specimen. Figure 4. Photomicrograph of Brunner’s gland hamartoma. On 6-months follow-up, the patient has no anemia. Brunner’s gland hamartomas are rare and benign tumors that occur mainly in the bulb, with less than 200 cases reported in the literature1. Most cases have been reported between the ages of 50 and 60 years, with no gender predominance2. They consist of abnormal proliferation of Brunner’s glands embedded in a fibrous stroma with bundles of smooth muscle and cystic dilated ducts1. Hyperplasia is the designation for lesions smaller than 5mm, which can be diffuse or circumscribed, and hamartoma isthe designation for lesions larger than 5mm, usually solitary pedunculated lesions2. Although often asymptomatic, patients can also present anemia due to gastrointestinal bleeding or abdominal pain and vomiting due to obstruction1. EUS plays an important role in the diagnosis of Brunner’s gland hamartomas before histologic confirmation of the ressected tumor1. Peloso A, Vigano J, Vanoli A et al. Saving from unnecessary pancreaticoduodenectomy. Brunner’s gland hamartoma: Case report on a rare duodenal lesion and exhaustive literature review. Ann Med Surg. (Lond.) 2017; 17: 43-9. Lee JH, Jo KM, Kim TO et al. Giant Brunner’s Gland Hamartoma of the duodenal bulb presenting with upper gastrointestinal bleeding and obstruction. Clin Endosc. 2016; 49(6): 570–4. Ultrasound Imaging Prize – Submit your Image/Video!